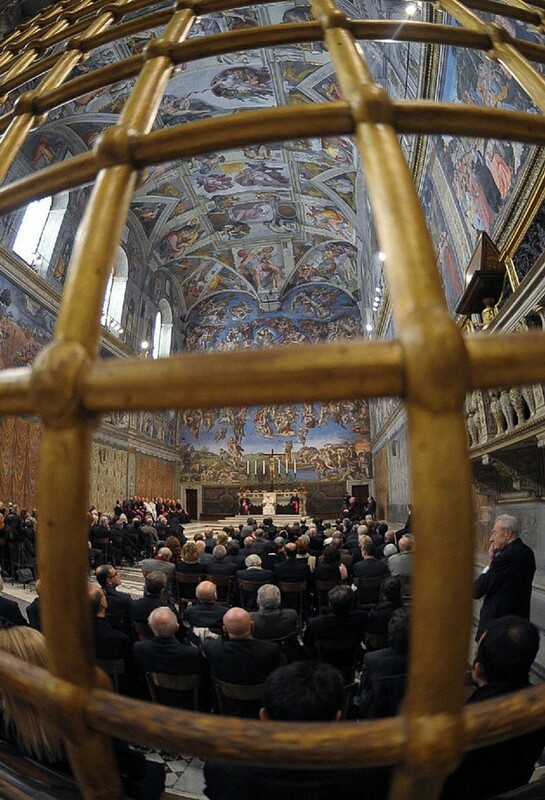 This morning, the Pope received a global group of 250 artists in the Sistine Chapel, commemorating the tenth anniversary of his predecessor's Letter to Artists and the 45th anniversary of Paul VI's encounter with the world of art. Dear friends, let us allow these frescoes to speak to us today, drawing us towards the ultimate goal of human history. The Last Judgement, which you see behind me, reminds us that human history is movement and ascent, a continuing tension towards fullness, towards human happiness, towards a horizon that always transcends the present moment even as the two coincide. Yet the dramatic scene portrayed in this fresco also places before our eyes the risk of man’s definitive fall, a risk that threatens to engulf him whenever he allows himself to be led astray by the forces of evil. So the fresco issues a strong prophetic cry against evil, against every form of injustice. For believers, though, the Risen Christ is the Way, the Truth and the Life. For his faithful followers, he is the Door through which we are brought to that "face-to-face" vision of God from which limitless, full and definitive happiness flows. Thus Michelangelo presents to our gaze the Alpha and the Omega, the Beginning and the End of history, and he invites us to walk the path of life with joy, courage and hope. The dramatic beauty of Michelangelo’s painting, its colours and forms, becomes a proclamation of hope, an invitation to raise our gaze to the ultimate horizon. 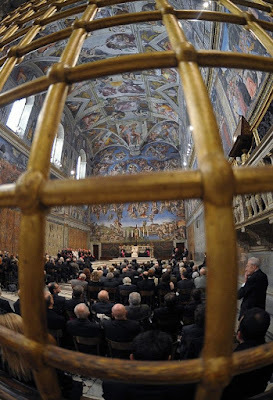 The profound bond between beauty and hope was the essential content of the evocative Message that Paul VI addressed to artists at the conclusion of the Second Vatican Ecumenical Council on 8 December 1965: "To all of you," he proclaimed solemnly, "the Church of the Council declares through our lips: if you are friends of true art, you are our friends!" And he added: "This world in which we live needs beauty in order not to sink into despair. Beauty, like truth, brings joy to the human heart, and is that precious fruit which resists the erosion of time, which unites generations and enables them to be one in admiration. And all this through the work of your hands . . . Remember that you are the custodians of beauty in the world." Indeed, an essential function of genuine beauty, as emphasized by Plato, is that it gives man a healthy "shock", it draws him out of himself, wrenches him away from resignation and from being content with the humdrum – it even makes him suffer, piercing him like a dart, but in so doing it "reawakens" him, opening afresh the eyes of his heart and mind, giving him wings, carrying him aloft. Dostoevsky’s words that I am about to quote are bold and paradoxical, but they invite reflection. He says this: "Man can live without science, he can live without bread, but without beauty he could no longer live, because there would no longer be anything to do to the world. The whole secret is here, the whole of history is here." The painter Georges Braque echoes this sentiment: "Art is meant to disturb, science reassures." Beauty pulls us up short, but in so doing it reminds us of our final destiny, it sets us back on our path, fills us with new hope, gives us the courage to live to the full the unique gift of life. The quest for beauty that I am describing here is clearly not about escaping into the irrational or into mere aestheticism. These ideas impel us to take a further step in our reflection. Beauty, whether that of the natural universe or that expressed in art, precisely because it opens up and broadens the horizons of human awareness, pointing us beyond ourselves, bringing us face to face with the abyss of Infinity, can become a path towards the transcendent, towards the ultimate Mystery, towards God. Art, in all its forms, at the point where it encounters the great questions of our existence, the fundamental themes that give life its meaning, can take on a religious quality, thereby turning into a path of profound inner reflection and spirituality. This close proximity, this harmony between the journey of faith and the artist’s path is attested by countless artworks that are based upon the personalities, the stories, the symbols of that immense deposit of "figures" – in the broad sense – namely the Bible, the Sacred Scriptures. The great biblical narratives, themes, images and parables have inspired innumerable masterpieces in every sector of the arts, just as they have spoken to the hearts of believers in every generation through the works of craftsmanship and folk art, that are no less eloquent and evocative. In this regard, one may speak of a via pulchritudinis, a path of beauty which is at the same time an artistic and aesthetic journey, a journey of faith, of theological enquiry. The theologian Hans Urs von Balthasar begins his great work entitled The Glory of the Lord – a Theological Aesthetics with these telling observations: "Beauty is the word with which we shall begin. Beauty is the last word that the thinking intellect dares to speak, because it simply forms a halo, an untouchable crown around the double constellation of the true and the good and their inseparable relation to one another." He then adds: "Beauty is the disinterested one, without which the ancient world refused to understand itself, a word which both imperceptibly and yet unmistakably has bid farewell to our new world, a world of interests, leaving it to its own avarice and sadness. It is no longer loved or fostered even by religion." And he concludes: "We can be sure that whoever sneers at her name as if she were the ornament of a bourgeois past – whether he admits it or not – can no longer pray and soon will no longer be able to love." The way of beauty leads us, then, to grasp the Whole in the fragment, the Infinite in the finite, God in the history of humanity. Simone Weil wrote in this regard: "In all that awakens within us the pure and authentic sentiment of beauty, there, truly, is the presence of God. There is a kind of incarnation of God in the world, of which beauty is the sign. Beauty is the experimental proof that incarnation is possible. For this reason all art of the first order is, by its nature, religious." Hermann Hesse makes the point even more graphically: "Art means: revealing God in everything that exists." Echoing the words of Pope Paul VI, the Servant of God Pope John Paul II restated the Church’s desire to renew dialogue and cooperation with artists: "In order to communicate the message entrusted to her by Christ, the Church needs art" (no. 12); but he immediately went on to ask: "Does art need the Church?" – thereby inviting artists to rediscover a source of fresh and well-founded inspiration in religious experience, in Christian revelation and in the "great codex" that is the Bible. Saint Augustine, who fell in love with beauty and sang its praises, wrote these words as he reflected on man’s ultimate destiny, commenting almost ante litteram on the Judgement scene before your eyes today: "Therefore we are to see a certain vision, my brethren, that no eye has seen, nor ear heard, nor the heart of man conceived: a vision surpassing all earthly beauty, whether it be that of gold and silver, woods and fields, sea and sky, sun and moon, or stars and angels. The reason is this: it is the source of all other beauty" (In 1 Ioannis, 4:5). My wish for all of you, dear artists, is that you may carry this vision in your eyes, in your hands, and in your heart, that it may bring you joy and continue to inspire your fine works. From my heart I bless you and, like Paul VI, I greet you with a single word: arrivederci!